Summer is around the corner–we promise. Even though it may not feel like that now, summer will be here before we know it. With that in mind we are gearing up not just our health when it comes to fitness but our health when it comes to giving our bodies nutritious foods. 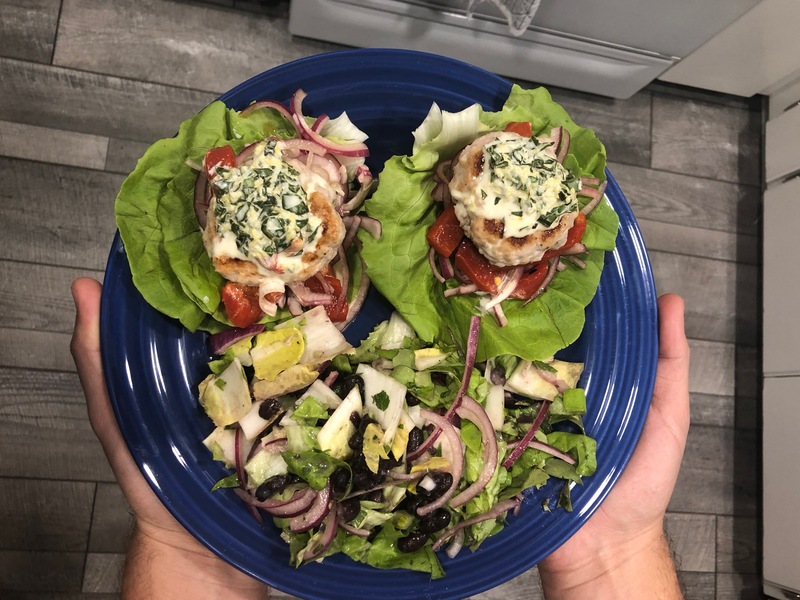 In the kitchen this week, we explored ways in which we can make some fun and healthy meals for a friends gathering. We looked up and down for some fun new recipes and decided to give this one a try. It is fun, easy, light and refreshing. 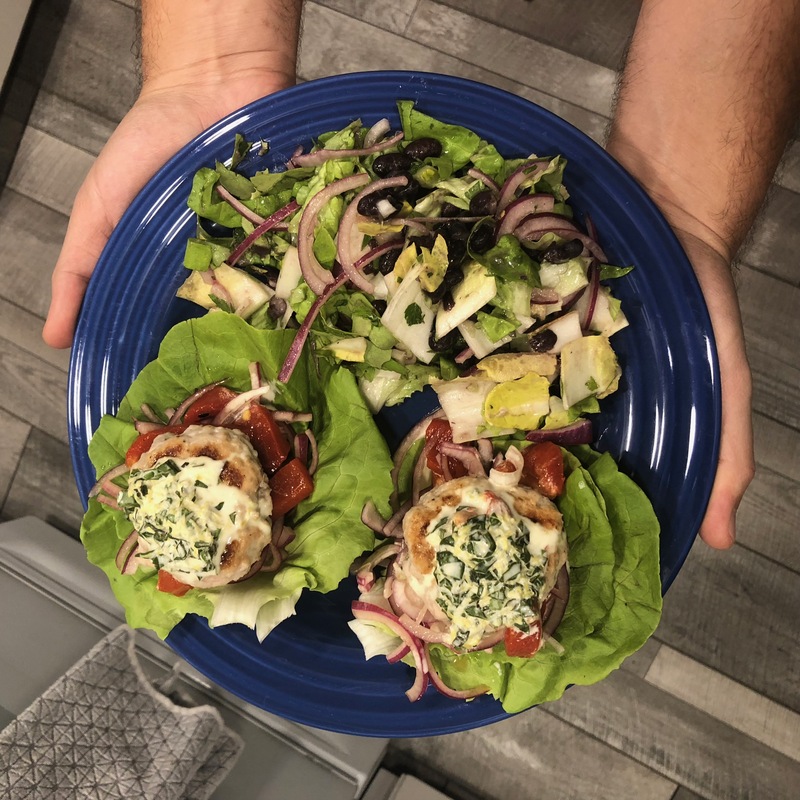 The part that really sold us, was the bean and endive salad that accompanies the turkey slides, oh and the basil mayo totally caught our eye too–because, well, basil-duh. This recipe is gluten-free and paleo friendly. Marinate the onion by peeling and thinly slice enough onion to measure 1 cup. In a medium bowl, combine the onion and sherry vinegar. Let stand, stirring occasionally, while you prepare the basil mayo and the burgers. Make the basil mayo by stripping the basil leaves from the stems; coarsely chop the leaves. Zest and juice the lemon, keeping the zest and juice separate (the juice will be divided between the basil mayo and the bean salad). In a small bowl, stir together the mayo, basil, lemon zest, and 1 tablespoon lemon juice. Season to taste with salt and pepper. Make the burgers by cutting a small corner from the ground turkey packaging and drain off any excess liquid. In a large bowl, combine the ground turkey and garlic. Season generously with salt and pepper and mix gently until just combined. Using wet hands, form the mixture into four ½-inch-thick patties. Make the bean salad by rinsing the black beans. Trim the root end from the endive; cut the endive in half lengthwise, then crosswise into ½-inch-wide strips. Trim the root end from the butter lettuce; remove the largest outer leaves and set aside for the burgers (2 leaves per slider). Cut the remaining lettuce in half lengthwise, then crosswise into thin strips. Set aside enough onion slices to garnish the burgers, shaking off any excess vinegar. Measure ½ cup remaining onion along with the vinegar for the salad. Save any remaining onion for another use. Scrape off any seeds from the roasted red peppers. Set aside for serving. In a large bowl, toss together the beans, endive, butter lettuce strips, parsley, 1 tablespoon lemon juice, 2 teaspoons olive oil, and the ½ cup onion and vinegar. Warm 1 to 2 teaspoons oil until hot but not smoking. Working in batches if needed, add the patties and cook, turning once, until browned and cooked through, 3 to 4 minutes per side. Transfer to a plate. Add more oil between batches if needed. Transfer the butter lettuce leaves to individual plates. 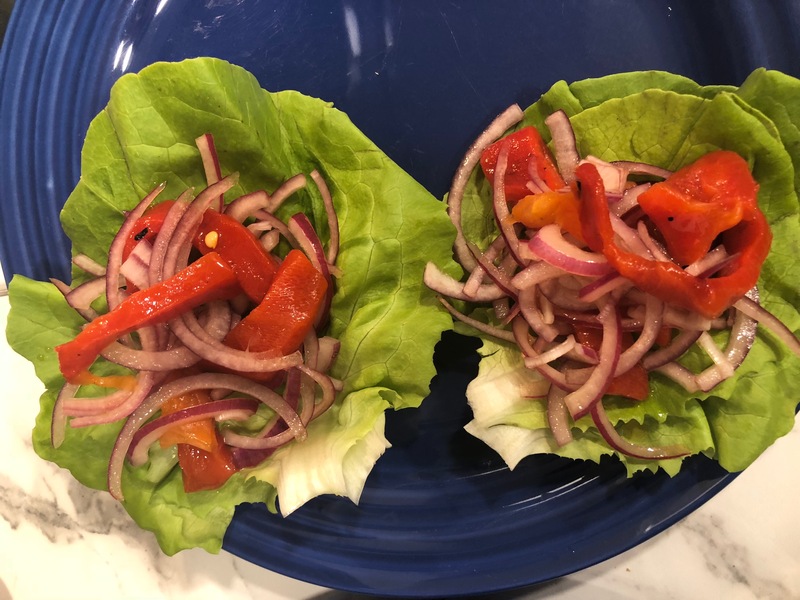 Top each leaf with the roasted red peppers, onion slices, a burger, and 1 teaspoon basil mayo. Serve the remaining mayo and the bean salad on the side.